If you're a musician who likes to learn new songs and techniques by listening to the same piece of music over and over but wish that the music could be played a little slower, then you'll enjoy Amazing Slow Downer. You can repeat any section of the music at full speed, slow it down or even speed it up by stretching the music by -50% to 400% without changing the pitch! You can also change the pitch up or down in semi-tones or fine-tune in cents (100ths of a semi-tone) to suit your instrument. This program works with your CD-ROM drive or any MP3 / Wave file on your harddisk and does all processing in real-time - no time wasted on recording or processing! Posted by Houston SEO Firm on Fri, 02/18/2011 - 20:26. You are right there as any musician would like to listen some section of a song little slower and pass on the rest faster and this feature would be of much help to him. It would save a lot of time and energy too. Thanks for the nice tutorial. Posted by Anonymous on Tue, 02/01/2011 - 00:45. I began doing this with my reel-to-reel in the 70's. I started out trying to do this with software in the early 90's with Cool Edit which worked, but not great. I bought this product in the late 90's and have never looked back. This works *AMAZING*ly well. It even lets you record your slowed-down file in the mpeg format, etc.. Works with CD's and MP3's and a number of other formats. I'm cheap, so it was a big effort to cough up the dough to pay for it, but it's worth every penny and more. I've used it to slow down solos, put songs in other keys, etc. The difference between the AMS and other software - its a very smooth, uniform playback. Very listen-able. You can mark up to 10 loops within the same tune, each with its own tempo, and keys if you want. Keyboard commands, as well. I started using this with Windows 95, and run XP now. I believe it works with Windows 7, OSX, etc. Hit the website. Posted by Anonymous on Fri, 10/02/2009 - 12:56. 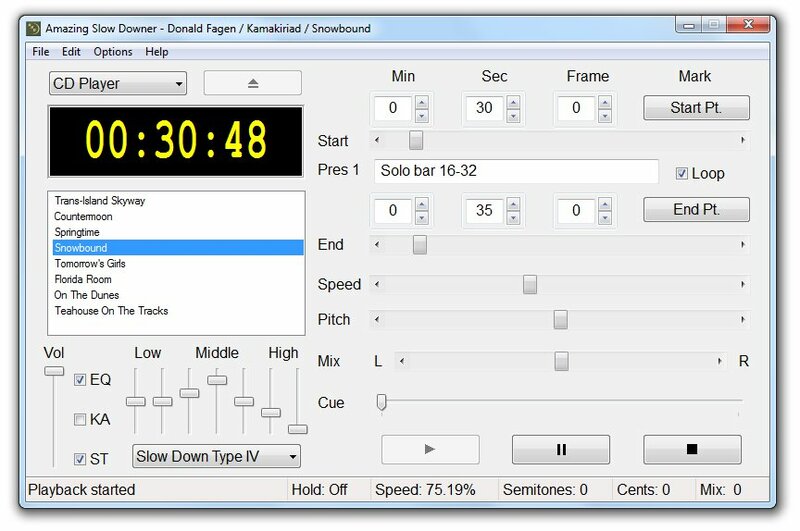 When will you make a Linux version of Amazing Slow Downer? Posted by Walter on Fri, 01/23/2009 - 17:06. I work as a teacher on a music-school in Sweden. Is it possible to by a school-licence to a cheaper price? And in that case, is it possible to buy the school-licence in Sweden? Posted by Stacey on Wed, 02/25/2009 - 04:52. Posted by Anonymous on Fri, 06/27/2008 - 00:54. Posted by Stacey on Tue, 10/07/2008 - 01:56. Posted by Tom Mc Dermott on Mon, 01/14/2008 - 21:21. Posted by Stacey on Tue, 10/07/2008 - 01:58. Posted by Adam Almond on Mon, 07/30/2007 - 19:17. I purcased a full copy of the 'Amazing SlowDowner' program for windows xp, from you on 3rd March 06 but unfortunatly I've recently had a virus and had to reset my pc so have lost the program. Please could you send me the nessassary links and information on how to obtain another copy of your progam. Posted by Stacey on Tue, 10/07/2008 - 01:59. Posted by Anonymous on Mon, 08/29/2011 - 20:27.